We are located walking distance to business centers and the main square of the city with the largest opera house in Siberia, just next to us you will find cafes, cinemas, entertainment centers and much much more. Friendly staff and warm family atmosphere will make your stay memorable in the Park hostel. In our hotel you will find business associates and friends, develop relationships, and fun to spend time with friends. We pay special attention span, here you will not find a speck of dust. Everything is made by you and for you. Park Hostel - this is the place where you want to go back! - Location of the hostel in the center of the city (from the central metro station, only 3 minutes). 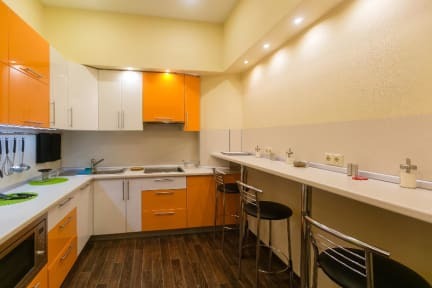 - Best quality / price ratio - accommodation from 350 rubles per day. Cancellation policy: 24h before arrival. This hotel may pre-authorize your card details before arrival.